What's a typical day like in the life of a steemcleaner? There's a bunch of administrative work organizing and logging things. But most of the day is hard work is sorting through the new section of steemit, basically trying to figure out if a post is legitimate or not. There's a few "tells" whether or not a post is more likely to be plagiarized (e.g. a new account), or a spun article (e.g. broken english), and sometimes it's just intuition. Another part of the day is unfortunately drama, and trying to convince people that what we are doing is justified. Not everyone cares about producing original content, and a lot of people don't mind if someone gets paid for someone else’s work, and sometimes there isn't much we can do to change their minds. And finally, we also try our best to generally help people. For example, people who have been unjustly flagged (see the r4fken case), we upvote them to unhide their posts/comments. Do you think your anti-plagiarism, anti-ID theft campaign is bearing fruits? I don't think we have made any significant progress. Guiding new users in the right direction is one thing, but unless our message reaches the higher ups, we are fruitless in our endeavours. The majority of whales are unconvinced in what we are trying to accomplish (@steemcleaners only has a very select group of followers and helpers), and furthermore, some whales go completely against our ideology. For example, one whale upvoted a bunch of recipe articles, to hundreds of dollars each. Within the same day, we saw a flurry of new accounts created that were just plagiarizing recipes, literally spamming tons of plagiarized content, hoping to "catch" said whale. And it worked. The whale upvoted many of the plagiarized recipes, and these spammers were rewarded. Sadly, when an average user sees this happen -- when spammers get rewarded, and they get nothing for their hard work -- they get frustrated and probably get tempted to leave the site. That's possibly contributing to the downturn in activity and price here. What from your own perspective should steemians look out for before upvoting or flagging a post? I say this over and over again, but no one listens. And I expect once again that no one will. Stop upvoting things without first considering who the poster is. This isn't facebook or reddit, your votes aren't worthless. They mean something, and you should take consideration on what you are rewarding, as what gets rewarded will be incentivized to continue, just like I mentioned with the recipe example. The more plagiarism gets upvoted, the more we will see of it. But on the other hand, the more that good, original content gets upvoted, the more of it we will see. So be selective, you are literally shaping the future of steemit with your votes. I have noticed that most people don't bother to flag spam or plagiarism, and that is sorely disappointing to me. Do take the time to flag spam, at the very least. We are witnessing a "bystander effect" where everyone is watching this garbage appear but almost no one is taking action to stop it. Which blockchain based features would you like to see as soon as possible? This is a tough question. There was a lot of talk on some potential censorship that came with "negative voting" or "vote cancelling" that was discussed recently, and I agree that these things need a lot more consideration before they are implemented. That may come to a surprise to many of you whom consider me to be some sort of thought police or even "hitler"; but yes, I am against actual censorship. The blockchain based feature here on Steemit that I would most look forward to is a more fluid way to use the witness list for rewarding Steemit activities. Right now the list is quite static, and the reward that the small oligarch gets is quite large. I would much like to see the oligarch break into a more decentralized approach, such that other users and projects would have access to the witness funds. I know many people would use their witness funds for good projects. For example, if I were a witness I would use ALL the funding to reward anyone fighting abuse. The robinhoodwhale or curie projects could use the funds as power to curate better. Many developers not in the top 19 are doing absolutely fantastic work too. But unfortunately, I do not even know where a lot of the funding is currently going -- so a smarter, more transparent, and more decentralized approach here would be very cool. 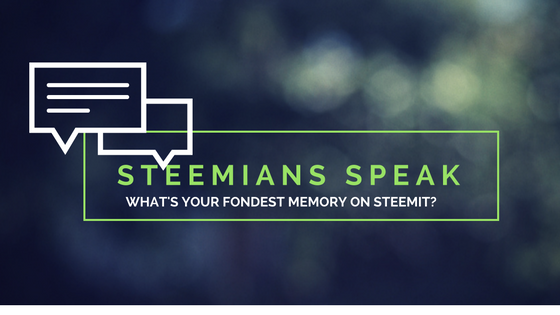 What’s Your Fondest Moment on Steemit? My best Steemit memory must be finding @stellabelle’s posts when I first joined this community. She was one of the first women I saw posting on Steem and she was brave, free, honest and full of great ideas. She encouraged me to start writing and creating my own work. Thank you StellaBelle! I remember having the idea to create steem.ly and having this nervousness to get the domain before anyone else, deploying the app and writing the announcement post. Many hours in the making and it was a great idea to not clog messages with long ugly links but list them simply with a cool looking short link like steem.ly/xyz. I remember reading the post dozens of times before pressing Post, tweaking it to perfection. After posting it, i had the post on one screen autorefreshing the page and steemitx on the 2nd screen constantly checking the stream of votes from the filtered list of whales. My heart was in a tight grip, waiting to see what recognition it gets. I kept staring at the screens for hours and at one point I laid back on the couch still looking at the monitors, falling asleep in shots (it was way past midnight) waking up from time to time. They are a moving mass that vie for which one excites me the most, Larken Rose joining, wow this is real I'm making money, my @chaospoet resurrection actually working and being an unusual outlet, and the acceptance and reception of the steemit community for articles personal in nature I was expecting ridicule and instead received support. The other was the moment I realized how much of a positive influence I became when I took a huge gamble by releasing Episode 1 - Awareness steemit.com … I didn't know how the community was going to receive it and what I did was open a door for others dealing with similar struggles to feel confident about sharing those struggles with everybody on Steemit. The moment that sticks out for me was when I had my first ‘big hit’. I was at work when I saw the payout go up to $200 and started to have a “manic attack”. My head was spinning, my cheeks were flushed. I couldn’t believe it. I went from being unsure if I could buy food this week to being paid for creating something I was passionate about! You always remember your first! The discovery of Steemit itself is the fondest memory. I remember the day I came across this site and was completely blown away. I couldn't sleep that night and the whole week that followed! Within Steemit itself, my fondest memory was when I received my first compliment for my article. This was so new to me and having people actually appreciate your content is just wow! My fondest memory of Steemit, was when I discovered it. The novelty, the excitement of finding something new, the research and all the questions...it was a thrill! ~ Steem retains last week’s position and it’s currently 7th on the coinmarketcap.com’s crypto market capitalization list. ~ Steemit co-founder @Ned launches Steem bounty system and also discusses proposal for voting rights delegation, steem power distribution and holding. ~$0.57 and $0.87 were the lowest and highest value traded this week for a unit of Steem respectively. Great updates, thanks for the plug! Just wanted to add, eSteem Android and iOS app is fully featured and functional app, not only browsing, but even more voting, posting, commenting, follow, transfer, dedicated profile pages with pictures, notifications, etc. Sure, please give it a try! Updates are coming weekly though, Android has update first then iOS is rolled out. @good-karma I installed your ios app but for some reason I have difficulties to get used to. I wish I could click on members to follow them. I am sure you will improve it a bit, hopefully. Great work though and thank you for all your efforts. @mammasitta, thanks for feedback... yes things are getting better with each update. follow me as well to get updates as they come out. Appreciate input and will include this in next updates. awesome sauce @infovore... thanks for that great chat and including me in your weekly mag. It's an honor to be a part of it. Nice to see you here.. Really had a great time chatting with you.. Looking forward to more projecta from you. Thanks @camilla . Great to see you drop by.. How are yo doing today? Great post. There has been a definite decline in plagiarism since the steemcleaners have been cleaning house. Progress is progress even if it is inch by inch. I support you guys completly. Especially when you said that bots jump in to try catching the whale upvoting random stuff, those are votes minnows could be getting on well thought out articles. Good job. I have noticed a decline in the garbage posts in the weeks you guys have been in business, So i know its working! I'm new to Steemit. It is a little complicated, but no questions right now. I am unfollowing today. I am sure the role you play serves a purpose, I simply cannot abide posts paying $1000+ that are entirely steemit based, when others get flagged or not recognized saying they're too steemit based.